The Lego Movie 2: The Second Part is a computer-animated children’s comedy action movie produced by Warner Animation Group, the sequel to 2014’s The Lego Movie (reviewed here). Five Years have passed since the dark events of Taco Tuesday when President Business (Will Ferrell) tried to use the CRAGL to fix all of the Lego people and Lego worlds into permanent positions, and since the first visitors from Planet Duplo arrived and started attacking the citizens of Bricksburg. Now Bricksburg has become a wasteland known as Apocalypseburg, with all of the Mad Max style post-apocalyptic treatments, warriors with custom-modified vehicles in dusty windblown ruins of the city. As a matter of safety they avoid building anything pretty, because that attracts the others from beyond the Stairgate to come and destroy again. Everyone has adjusted to this new gritty post-apoc future. Except Emmet Brickowski (Chris Pratt), who still thinks everything is awesome, and acts like nothing has changed. Something new comes to visit them, Sweet Mayhem (Stephanie Beatriz), an envoy from Queen Watevra W’nabi (Tiffany Haddish), and kidnaps Batman (will Arnett), Lucy (Elizabeth Banks), Benny (Charlie Day), MetalBeard (Nick Offerman), and Unikitty (Alison Brie), and takes them through the Stairgate to the Systar system. Only Emmet can bring them back. As with the first movie, there is a parallel real-life human story that provides a structure around which the movie is built, and justifying some of the plot points which otherwise wouldn’t make sense. It’s this set of parallels that are one of the best parts about these movies. While this one doesn’t have the inherent novelty of the first in the series, they did a great job building on that, in particular in how the children who are now five years older, interact and how that produces the plot of this movie. The one thing I wish they’d done a little more of is to give some more development to the returning secondary characters (like Unikitty and MetalBeard), I felt like those were kind of glossed over, probably just for time constraints. But otherwise I thought it was a solid entry in the series and well worth seeing. 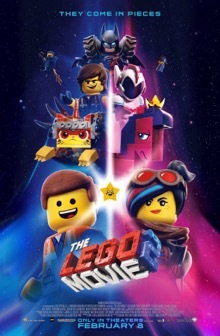 I would definitely recommend seeing the first movie first, because both the Lego plotline and the human family side of it would benefit from knowing where they came from.